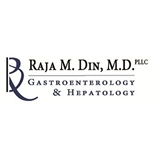 Raja M. Din, M.D., PLLC (Greenbelt) - Book Appointment Online! We provide diagnosis and treatment of all types of digestive and liver disorders. We also provide screening for colon, esophageal, and gastric cancers. We focus on thorough exams - checking your total health before performing procedures. We take an integrative approach to your treatment, paying careful attention to dietary and lifestyle factors, in addition to the relevant gastrointestinal symptoms.We appreciate the confidence you have placed in us and look forward to working with you.